Bunchball Nitro for Events is a service that allows companies and organizers to create customized experiences using game mechanics to help people meet. It can be used on any smartphone and tablet and Bunchball says the organizers can have it all up and running with built-in social features, trivia, and check-in tools within a week. Types of ice-breakers and engagement tactics the services uses includes sending attendees on a “secret word” mission where they’ll need to go meet and network with others to discover the answer. Other activities include trivia challenges that test users to see which can retain the most information after listening to presentations to see who retained the most information. A content-based task also is available to encourage attendees to view or download event-related information to their mobile device. Granted, these activities don’t sound like the most glamorous things to do at an event and one might have a better chance at networking at a bar in one of the after-parties. However, during the day, these things aim to help avoid meetings from becoming too dry and more interactive. 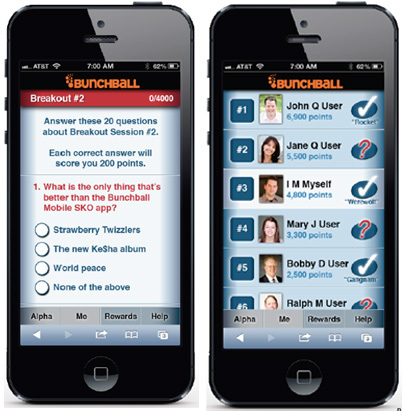 Bunchball says that as attendees work their way through each challenge and mission, they earn points that are recorded on a leaderboard. The top point earners can receive a reward, as specified by the organizers — think of it like a professional Chuck E Cheese setting. Joe Fisher, Bunchball’s Vice President of Products, says that the hope is when attendees connect with one another, they’ll be able to share ideas, information, and best practices not only for the short term, but also on an on-going basis. He says that when attendees return back to their day-to-day worlds, they’ll encounter situations that may require the “birds of a feather” network that could have started at the meeting. Finding ways to help bring people together and connect them under one banner can be difficult. With tons of social media services out there, it’s very discombobulated. Whether it’s sharing on Twitter, Facebook, Plancast, LinkedIn, or on conference community tools like Pathable, Bizzabo, Shhmooze, Sched, or CrowdVine, finding someone to remain on one app is tough. Started in 2005, this Silicon Valley-based company has worked with many large consumer and business-focused companies including Warner Bros., Adobe, HP, Cisco, VMware, Comcast, NBC Universal, ABC Television, Stella & Dot, Live Ops, and many others. It calls its Nitro product the “most scalable and reliable gamification platform”, which it says has over 125 million users tracking over 15 billion actions. 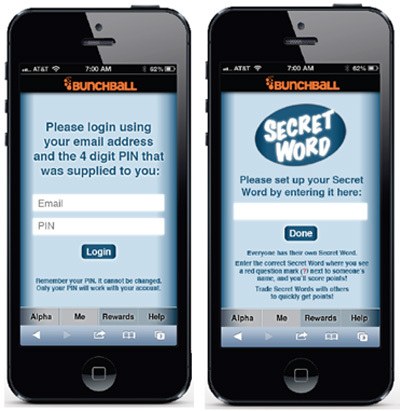 Bunchball has raised $12.5 million in funding from Adobe Ventures, Granite Ventures, Triangle Peak Ventures, Correlation Ventures, and Northport Investments.